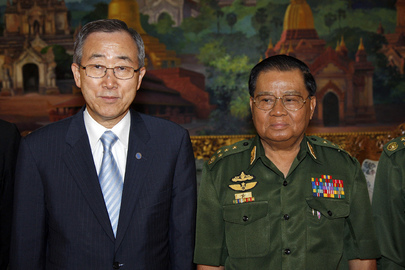 UNITED NATIONS, July 2 -- As UN Secretary General Ban Ki-moon approaches Myanmar to meet with its military leader Than Shwe, information about his performance on the trip became even harder to come by. On June 29, Ban's spokesperson Ms. Montas told Inner City Press that the UN in hand selected the reporters who could accompany Ban "picked people who were willing to pool for others." On July 2, when Inner City Press asked Ms. Montas when these pool reports would begin, she reversed course and said that only TV images would be pooled, no print. Video here, from Minute 19:07. Even on Ban's first trip to Myanmar, when he says he saved 500,000 people, wire service reporters gave information from their notes to a UN staffer named Hak-Fan Lau, who is also on this trip, for dissemination to other reporters who cover the UN. Faced with a spate of negative publicity, Team Ban is providing even less information now than then. Some surmise this is an attempt to control coverage. 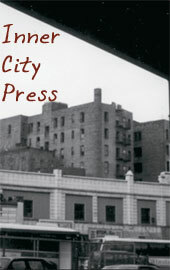 Ms. Montas told Inner City Press to wait to see what the reporters with Ban published. "We gave priority to wires... three or four, sorry, three are traveling with the Secretary General." The confusion between three or four wires appears to depend on whether South Korea-based Yonhap, which was selected to go, is considered a global wire service. AP, Reuters and AFP are all on the trip, as is a correspondent from the New York Times. Another major U.S.-based daily, which along with two other media organizations the UN met about on May 8 with an eye toward suing, was not allowed to go. Inner City Press asked Ms. Montas to confirm the information in a list it has seen, that there are at least 22 UN personnel in Ban's traveling party, ranging from political chief Lynn Pascoe and deputy chief of staff Kim Won-soo to the aforesaid Hak-Fan Lau. "I can check for you," Ms. Montas answered. By 6 p.m. on July 2 in New York, no information was provided. The UN in New York is closed for holidays both July 3 and 4 when Ban is in Myanmar. Still, watch this site. UNITED NATIONS, June 29 -- Myanmar's courts have barred two of Aung San Suu Kyi's four witnesses, just as UN Secretary General Ban Ki-moon announced he will travel to the country on July 3-4. In New York, Inner City Press asked Ban's spokesperson Michele Montas if Ban has any comment on the barring of these two witnesses, Win Tin and Tin Oo of the National League for Democracy. Ms. Montas said of Ban, "He's not talking about the trial right now." Video here, from Minute 17:23. Inner City Press asked, since in previous trip Ms. Montas' office had informed all UN resident correspondence of such trips and allow them to ask to accompany the Secretary General, if that was done in the case of Myanmar and if not, why not. Montas admitted that it was not done. She said that from among "people who had expressed interest" they "picked people willing to pool for others." Since Inner City Press has asked numerous questions about the UN and Myanmar of Ms. Montas and others in the UN briefing room, one wonders what "expressing interest" means. Asking publicly in the briefing room does not count, Ms. Montas said. "You have to come to my office and register on a list." In fact, Ms. Montas' Office reached out to media organizations which indicated they would have staffers from Bangkok and elsewhere in the Far East accompany Ban and told them that Ban wants only particular reporters who cover him at the UN. It would appear that, faced with negative press coverage of the first half of his term, particularly of his pro-government victory tour in Sri Lanka, Team Ban has sought to control how the Myanmar trip is covered by hand selecting who gets to cover it. Watch this space. UN's Ban Tells Only Some Media of Myanmar Chance, Bad Press Left Behind? 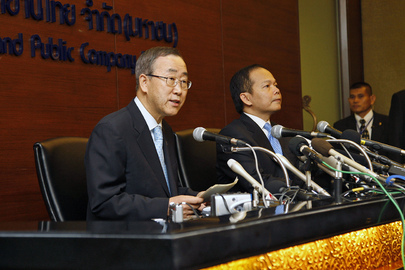 UNITED NATIONS, June 28 -- With UN Secretary General Ban Ki-moon reportedly still undecided if he will stop in Myanmar on his upcoming trip to Japan, Ban's press office has nevertheless quietly selected the journalists who would be allowed to cover his visit with the country's military rulers. Until now, the Office of the Spokesperson for the Secretary General has informed at least all resident correspondents at the UN of the possibility of a trip, and to apply if they are interested in going. This time, Ban's office refused to confirm when asked by the Press that he would go to Myanmar, while behind the scenes pre-selecting which journalists would be allowed to accompany him. Some see this is a reaction to the increasingly negative media coverage Ban has been receiving. As Inner City Press asked Ban during his last press conference, the Economist rated him three out of ten on speaking truth to power. Specifically raised was his performance in Sri Lanka where, as covered by Inner City Press, Ban smiled as Tamil children detained by the government were made to sing his name. The goal, some surmise, is to try to avoid that kind of coverage in the future. Even Charlie Rose, television's friendliest interviewer, last week asked Ban about his failing grades. Ban responded by saying that he had saved 500,000 people in Myanmar. Inner City Press asked Ban's Spokesperson Michele Montas where this figure came from. The number of people in need, she said, when Ban last visited Myanmar. There was another side to Ban's agreement, of course: that Than Shwe's regime took 25% of all aid money by requiring conversion through Foreign Exchange Certificates whose value the government controlled, as exposed by Inner City Press and then others. With Aung San Suu Kyi being tried for the non-consensual visit of a groupie, facing extended detention, and amid reports that Myanmar is seeking to illegally import weapons from North Korea, Ban's current Myanmar envoy Ibrahim Gambari visited Myanmar in order to provide a briefing to Ban. African Ambassadors to the UN have told Inner City Press that Ban recent offered by Gambari to replace Rodolphe Adada as envoy in Sudan, calling into question either Ban's or Gambari's commitment to Myanmar. But the "insides' game" to pre-select the journalists who would be allowed to cover Ban in Myanmar may further call into question this UN's commitment to free press. Those not informed of the change included not only Inner City Press, but another of the three media organizations which Ban's management chief, spokesperson, speechwriter and Under Secretaries General for public information and legal affairs met about on May 8, with an eye toward legal action and constructive censorship, click here for that story. And watch this site. Footnote: Some claim that the UN made the list based off those who asked about Myanmar. During Ban's last visit to Myanmar, his Office allowed the Than Shwe regime to blacklist media which the UN had already invited to come. This may be a new stage, in which the UN asks the regime who they would like to come, rather than making all UN correspondents aware of the opportunity. Inner City Press:On Myanmar, the Government has said that Mr. [Ibrahim] Gambari is in the air and will be there. Can you confirm that? And what is the process, if he is going there... to brief the Secretary-General? Is it determined that the Secretary-General will go? Spokesperson: The Secretary-General is going to meet with Mr. Gambari, as soon as Mr. Gambari comes to New York, and this is before the Secretary-General takes off for Japan next Monday. So he will be reporting this weekend to the Secretary-General. Inner City Press: He was on Charlie Rose last night. Is that correct? Inner City Press: Among other things, I heard him to say in Myanmar, he saved 500,000 people. What’s the basis for that number? Spokesperson: The basis is the number of people that were in need at the time when he obtained the access for humanitarian workers into Myanmar. UNITED NATIONS, June 24 -- While current UN humanitarian coordinator John Holmes has commended the Sri Lankan government for how they are running the UN-funded camps where they have detained 300,000 Tamil civilians, his predecessor Jan Egeland on Tuesday told the Press that we can "safely assume... horrors" in the treatment of "women in Sri Lanka, Tamils," due to the continuing denial of access not only to humanitarian review but also "witnesses." Video here, from Minute 26:06. 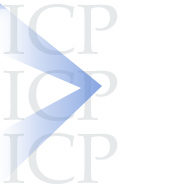 Last week Inner City Press asked for the UN's and Holmes' response to the Sri Lanka government barring even UN workers from bringing cameras into the internment camps. There was no response, nor to the disbanding of the investigation into killings such as that of 17 Action Contre la Faim aid workers near Kilinochchi. On June 22 and again on June 24, Inner City Press asked Secretary General Ban Ki-moon's spokesperson about two UN system staffers grabbed up by the government, by plain clothes men in unmarked vehicles. Even though the UN in Colombo belatedly admitted what happened, Ban's spokesperson on June 24 told the Press "we are trying to get information on what happened, got your question yesterday." Video here, from Minute 10:10. But it happened ten days ago, and was asked about on June 22. To many, it begins to be part of the cover-up. Egeland was in New York for a UN Colloquium on Conflict Related Sexual Violence in Peace Negotiations. Inner City Press asked for his view of the UN's performance this year in Sri Lanka. 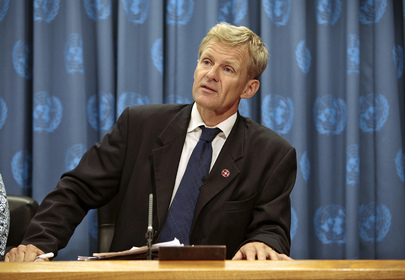 "Sri Lanka is the latest example of the world community letting a government get away with denying access, to witnesses, humanitarian relief, protection of civilians," Egeland said. He said that the Responsibility to Protest, enacted by the UN in 2005, was "not upheld in Sri Lanka, the heads of state have failed." 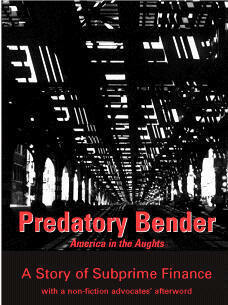 He predicted that conflict will brew because injustice is occurring. He added, that he was not saying this as a UN official, that he is now with the Norwegian Institute on International Affairs. 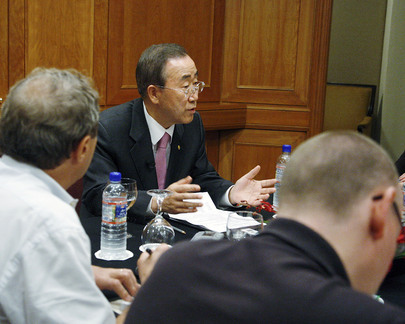 In the run up to the Colloquium, two current UN officials came to speak to the Press. Sri Lanka was raised by Inner City Press, and the UN Development Program briefer answered and then said, "that is all off the record." Why can't the UN speak on the record about Sri Lanka, as staff are disappeared and civilians killed and locked up? Why is it only an ex-UN official who can admit that on Sri Lanka, the UN emperor has no clothes? Watch this site.